The NUFORS removes condensate from compressed air systems. The operation is automatic and there is no unnecessary compressed air lost during the condensate discharge cycle. 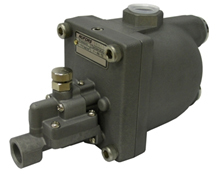 The NUFORS uses pneumatic forces to operate the valve assembly and is ideally suited in applications where power is not available, too expensive or not reliable.